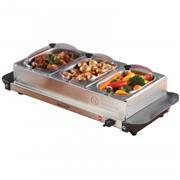 Keep prepared foods hot and ready to serve with triple buffet server. Prepare your menu items in the kitchen (or even use the pans to cook your foods), then simply transfer the food pans to this server and your meal is ready to be served! Without food pans, this versatile buffet server can also be used as a warming tray. Includes 3 third size stainless steel pans and a clear polycarbonate plastic roll top lid with utensil slots. Each steam pan will hold over 1qt. servings. Tray is made of durable stainless steel. Stainless steel pan holder is removable so the unit can be used as a warming tray. The Buffet Server has 4 non-skid feet.